I finally illustrated this recipe. Yay! Here are the full instructions. It is the best recipe for any tomatoes I know of, and not only can you add these tomatoes to any recipe to make it better, but it even makes out-of-season, mealy, and pale tomatoes taste good. This recipe is from my Mother-in-law, Betty C. Fuches. We make it all the time, and it will always be a favorite . whatever spices you like…I use a garlic mix like Mrs. dash (cause I’m lazy). I started making this with small plum tomatoes during the off season, but seeing as all those lovely tomatoes are in season now, you want to cut a normal sized tomato into 3 chunks (each about the size of a small plum tomato). You can also use cherry tomatoes, but the tomatoes shrink when you cook them, and you’ll have to use a bunch per serving…. but use whatever you have! Remove the seeds and liquid… I just squeeze them, and scoop it out with my hands. Roast for 3 or 4 hours at 250 degrees. You can shorten this by bumping up the temp to 325 or so….it’s still good, just not quite as good.I know that sounds vague- it’s always different depending on what tomatoes you use. Just keep an eye on them….they should shrink quite a bit in size, and deepen in color and flavor…..mmmmmmmm. Remove the pan from the oven and move the tomatoes onto a serving plate. Retain any leftover oil and juices. 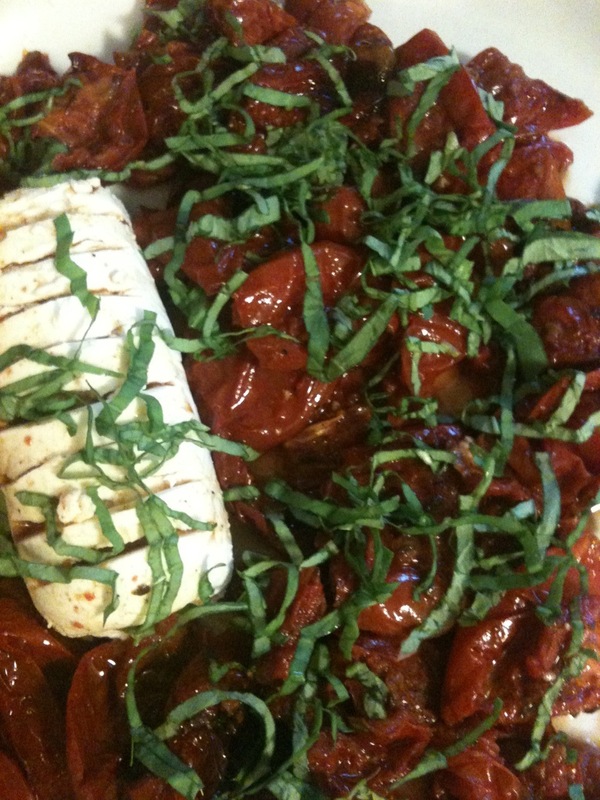 ( the slower you roast the tomatoes, the more juices you’ll have) Unwrap a hunk of goat cheese and put it next to the tomatoes…. dribble oil and juices over the goat cheese. Sprinkle the basil over the tomatoes. Slice the baguette and serve with the tomatoes…… one slice of baguette smeared with goat cheese + a tomato or two on top = heaven.